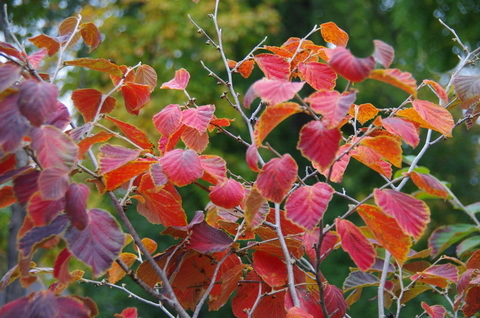 Dallying In The Dirt, Issue #276 - The witch hazel fall colours are wonderful. This wonderful Witch Hazel, Hammamelis x intermedia Diane starts and ends the garden season in spectacular fashion. You saw pictures of it in full bloom away back in March and here it is in late October with some of the best autumn colour in the garden. They are easy to grow and can be pruned as a small tree or a multi stemmed shrub. This particular one is becoming a tree shape because of its location. It is adjacent to the path leading through the back garden and it needs to be rather thin at the bottom so that we can push a wheelbarrow past it and now it is being allowed to spread to a bigger head just above my height so that I can easily navigate the path and yet have that path made interesting by its arching branches. Taller people may have to duck a bit to get by but it is my garden. There is lots of other activity in the garden as the days get noticeably shorter. The squirrels have done a very poor job of collecting and burying the walnuts, leaving us with a significant quantity to pick up and put to the curb in yard waste bags. The problem is their weight. About 15 - 20 cm of walnuts in the bottom of the bag and it is approaching my weight limit. We can stuff the rest of the bag with leaves or the Boston Ivy vine, anything that has volume without weight. If the squirrels had managed to bury them all the yard would look like a miniature bomb range. Heat! Lots of it! These All America winning hot Peppers, Flaming Jade have been quite productive this year. I like some of my food a bit warm but one of these Peppers easily makes any dish exceed my comfort level. The Mexican chef at one of our favourite restaurants said that he would be happy to take any that I wanted to give him. I do find other ways to utilize and store that heat for the coming year. I create a hot oil to cook with. 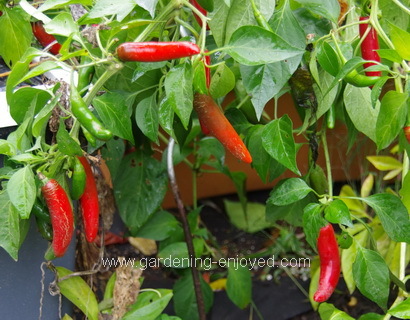 A handful of these Peppers are put in a large pot with some good cooking oil and then carefully boiled. It needs to be a large pot to allow room for the extensive foaming as the water content of the Peppers is boiled away. Once it all calms down we can pour the cooled oil into a jar to keep beside the stove. A couple of experiments will teach us just how hot that oil is so that we can learn how much to use when cooking. The Peppers that you see in jars of purchased oil are really just for show as the heat will only transfer to the oil by heating them together. Every year I plant some Potatoes in a large Terra cotta pot and grow them beside the deck. This year’s heat and drought created, by midsummer, a daily chore of watering them. There was some soluble fertilizer in that watering can most days, Potatoes are hungry beasts. We have learned over the years that some varieties, like the fingerling types, do better in a container than the larger tubers do. Each year it’s interesting to see what the results are. This year there was lots of top growth and I was hoping that meant a good harvest in the pot. There were a considerable number of tubers but they were noticeably smaller than the same varieties that were grown in the garden. They will still provide Potatoes for our dinner plates for several meals and we actually prefer smaller tubers most of the time. Like all things in the garden each year brings different results and that leaves me spending the winter trying to make some sense of it all. Usually without much success. Steve Asks? This year, the squash and musk melon all cracked open while still on the vines. The cabbages split regardless of the fact that it was so very dry. Is there some reason that you might know of that would cause these problems? Patricia Asks? Japanese tree peonies......my friend has some seeds..can we plant them?..do so enjoy your columns. Ken Answers! Of course you can plant them but you really want to know if that would be a waste of time :-) Most Tree Peonies here are grafted and not grown from seeds. 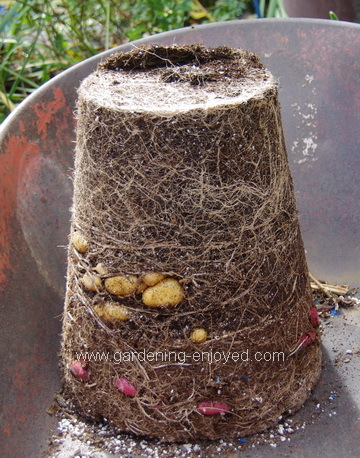 Tree Peony seed can take up to 2 years to germinate and 5 years to flower but they do so somewhat reliably. It's best to start them in pots and inside so that you can keep track of where you planted them. Since the parents are likely some type to hybrid you will discover, after waiting 5 years, that the new blooms may be quite different from the original. How much patience do you have?